Biogas is a renewable energy source that is slowly getting more traction in Europe. It is freshly-produced methane, the ecological equivalent to its more well-known sister product, fossil-fuel natural gas. While much of Europe is heated by non-renewable natural gas, industries are run on natural gas and cars are powered by compressed natural gas, CNG, renewable biogas has been slow to take a sizable market share. And this makes no sense as making biogas is so simple the Chinese were doing it 3000 years ago. In fact the anaerobic processes that produce biogas are inside all of us. Why then does a simple technology not spread more rapidly? There is a myth that biogas is complicated to produce and is very dangerous to handle. Neither is true. In recent years there have been efforts to popularise biogas micro and nano-level production with simple technology in kitchens, basements and backyards. While this movement has spread “people’s biogas” outside Europe, in Europe regulations have put a lid on rapid dissemination of the simple age-old technology. After 15 months of applications, appeals and dialogue Suderbyn Permaculture Ecovillage in Sweden was able to get permission to start up operations of its micro-biogas digester. The 10 cubic meter unit is a Chinese “family-size” digester based on the improved Puxin company design. Very likely the first of its kind in Europe, the digester on the Swedish island of Gotland is the first unit made from imported Chinese steel molds gifted to the ecovillage movement of Europe by American Professor TH Culhane and his Solar CITIES network. While this larger family-size Puxin model has spread in other parts of the world, in Europe it is Professor Culhane’s low-budget alternative, the one cubic meter IBC model developed for the slums of Cairo which has spread to a number of intentional communities which have started biogas operations informally. The dilemma of getting permission put a damper on interest in constructing the larger concrete digester in Europe. This may now be changing with the Swedish digester starting operations legally. Robert Hall of Suderbyn reports that the permission was initially denied when the Solar CITIES solution of soft 1-2 cubic meter gas bags for storage and transport was proposed to the municipal Region Gotland and later appealed to the Swedish Civil Contingencies Agency, MSB. Region Gotland had no problems with the unit’s production of biogas, only with the storage aspect. After many months of dialogue with the national agency and numerous gas consultants, gas enterprises and bottle manufacturers, the only solution that the Swedish government could recommend to Region Gotland to accept are gas tanks expressly manufactured for biogas. Thus Suderbyn procured biogas tanks of crashed biogas vehicles and had them re-certified for use at a lower pressure. Mere certification of two VW Passat gas tanks in the end cost 3000 EUR but this was sufficient to receive permission for production and storage. The ecovillage estimates that it will take a few more months to finalise the documentation and installation and get the biogas system running. The ecovillage plans to use the biogas produced to heat buildings and cook food. The biogas unit plays a key role in the “closed loop” year-round food and energy production system being developed a Suderbyn. The ecovillage is currently building a Piggot wind turbine to power the system and is finalising other support infrastructure for the integrated biogas and aeroponics system. 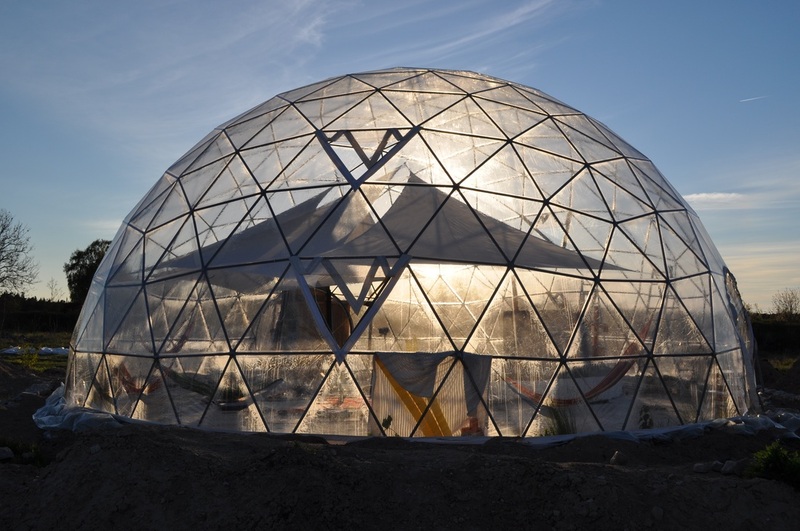 The development of the “closed loop” system in a geodesic dome is currently financially supported by the Baltic Sea Conservation Foundation, BaltCF of Germany and will be technically supported by the Natural Resources Institute Finland, Luke. Besides Professor TH Culhane, Suderbyn was helped by the combined efforts of Tamera Healing Biotope 1, Lush Cosmetics and the Blueprint Project to be able to construct the Chinese biogas system during the summer of 2015. Other ecovillages in Europe have the opportunity to free-of-charge replicate the biogas unit using the set of Chinese Puxin molds.